I rarely, if ever, voice my personal thoughts on things... I am breaking that rule, just because I wonder if it's just me who just "doesn't get it" all the time. 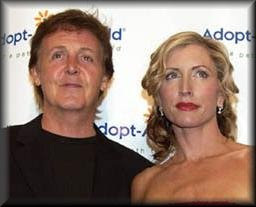 Now, admittedly I never knew who she was until she married Paul McCartney. My third "knowledge of her" was in Dancing With the Stars. She did not impress me. False leg or not I didn't feel any pangs of sympathy for her since she was a lucky one and could afford to care for her problem without going without eating like some of us would. She said her participation on the program "raised a fortune for our charity, and hundreds of thousands of animals' lives will be saved." Now, don't get me wrong. I don't think the wealthy should just give away all their money to charity. After all.. everyone has to live, and she has a long life to live yet. But it sorta made me laugh. (warped sense of humor) Here's a multimillionaire who could easily give that charity the amount she said she raised and not bat an eye... but did she? (I can't say but I doubt it) Instead, she helped "beg" for money from those of us who live paycheck to paycheck, social security to social security. Those who really CAN'T afford it! It made me think of others in her financial position who do the same thing... they go out there and say "look how great I am helping raise money for this or that"... KNOWING they are taking it from those who can least afford it. Is it just me? Or is there something wrong with this picture? Oh, I realize that many contribute also.. but I also know many who contribute and DON'T use their "celebrity" to ask those of us not wealthy to share what we do have. Why don't they just get their other "wealthy" friends together and give a big contribution ?... yeah.. now that would make me look at them in a different light! I guess it just bugs me that someone who couldn't possibly spend the amount of money they have in their own lifetime... to ask those who don't have it to help with money that they don't have to spare, but do it anyway. This says much about those who do contribute.. but what does it really say about the multimillionaire who only contributes because their financiers say to so they get a tax break?? If they are truly into a certain charity then figure out how to get the big bucks from big businesses and wealthy people! I have no idea why this struck me today. I guess I just heard her say that they raised alot by her dancing, and my mind just went , "excuse me? whatever the amount you raised thru those of us who are barely making it, I'm sure you could have given them without batting an eye!"... and for some unexplained reason, that thought bothered me. So.. now that I've gotten that off of my chest... how was your day? Last night on Grey's Anatomy stood Jeffrey Dean Morgan! (see photo in post below) Hello?! Oh, thank you, thank you! I didn't even mind that the only thing that the show was about was "recapping" the entire show... just having Jeffrey Morgan, in view, narrating it was ..well.. made me smile! Now, how someone, the age of my own son, can make me smile is a mystery! I don't "do" young! But, dang it.... this guy makes me crack myself up thinking: If I were young you'd wear out your running shoes from me chasing you! LOL... Many thanks to whoever decided to have him on the show if only to remind us all how fabulous that arc of episodes was. Tomorrow I am actually getting away from the house for the day! (always a great day when this occurs!) The Chiller is having another autograph show, but this time they've moved to another town and another hotel. Heh.. well.. truth be told, the folks running it don't do a bang up job and keep getting "kicked out" of hotels to have them at. It makes me wonder when they will run out of places to have it. As it is now.. it's still a long way off for the taxi I have to take to get there, but at least it's still here for me to get out for a day every 6 months or so. Thankfully we will be getting a one day break from the nasty weather we've been having.. then on Sunday we are in for a "Nor-Easter" with heavy rains and blowing winds. The temperatures here are not indicative of Spring! They are staying in the 40's mostly with a "now and then" day in the low 50's. The poor Magnolia tree went and bloomed one day and the pedals turned brown the next day from the cold! It seems we are being punished for the mild (no snow) winter we had. New Jersey is skipping Spring this year. One last note before I post this. I received a book in the mail, which I began reading. (note: i have not changed the book title with Myrtle in the side bar). I am 143 pages into this 786 page book... and it is boring as all get out! I am doubtful I can continue it too much longer! The name of the book is, Jonathan Strange and Mr Norrell. It takes place in England and is said to be about 2 magicians and bringing magic back to England. 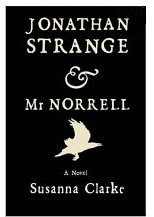 Well.. Mr Norrell is not very interesting... and it took all 143 pages to first mention Jonathan Strange! Exciting, it's not. This has got to be the first book I've considered putting down in a long time. Gladly, it was on sale and I didn't pay much for it. So.. at this point, all I can say is, if you have seen this title and are considering getting it... don't waste your money! This is it. It's big. It's black. It's not very interesting! 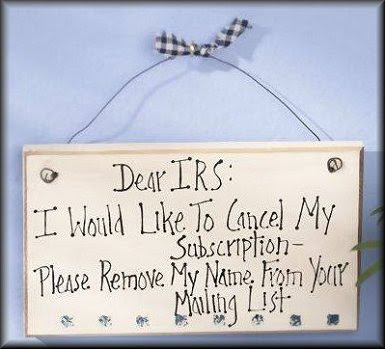 While kids are dreaming of chocolate Easter bunnies... the adults would like to tell the IRS to take a flying leap! I've used this sign before.. but it's getting close to the magical date of April 15th, so I thought I would post it again... if only huh?! I've been reading my latest Cornelia Funke book for young adults. This one is even more "young" then I thought it would be. I have a little difficulty when the animals talk.. well, unless it's "mind to mind" sort of thing. In this book the animals and people both talk.. At first I thought..oh boy, this is younger then I can handle... but, then her fine story telling took over and I find it's an enjoyable read. This would be a great book for an 8-10 yr old to read or to have it read to them. I have found Cornelia Funke to be a really fantastic writer! And I'm glad I have even this book among my collection. Now I own 4 of her books. This one, Dragon Rider, would be for the youngest that I've read. Thief Lord, I am guessing is for 8-12 yr olds, and I'd read a second book with the same characters, should she ever do more with them. And her latest books, Inkheart and Inkspell (3rd to come out this year) are the best of all, for it truly surrounds the love of books. My guess here would be from 10 yrs old and up. This is an author I will continue to watch. Aside from that... it would seem Easter is almost upon us! And New Jersey is going to have a cold one. The forecast for the next five days remains in the low 40's. I think the Easter Bunny will be wearing mittens and a scarf and Easter bonnets will be made of wool! It put me in mind of one Easter when I was young... that would be back when Broadway was a prairie!.. anyway.. We had late blizzards this one year and the snow had been piled really, REALLY high. On this particular Easter, which was early like this one, we had those piles of snow still on the ground.. but the temperatures had risen nicely and everyone was in their Spring finery, which really looked strange with all the snow still in piles. At least this year there is no snow.. so I am thankful for that. But, I won't mind when the temps are in the high 60's and low 70's! That's my favorite time of year both in Spring and Fall. It doesn't last long, and sometimes we miss it completely, but it's oh so nice when it's here! Hmmm, I've been tagged for a meme by Karmyn. The only trouble is, that it's been going around for a while now and many I would list as "Thinking Blogs" have been used already. First I guess I will give you the link where it began: Here it is! 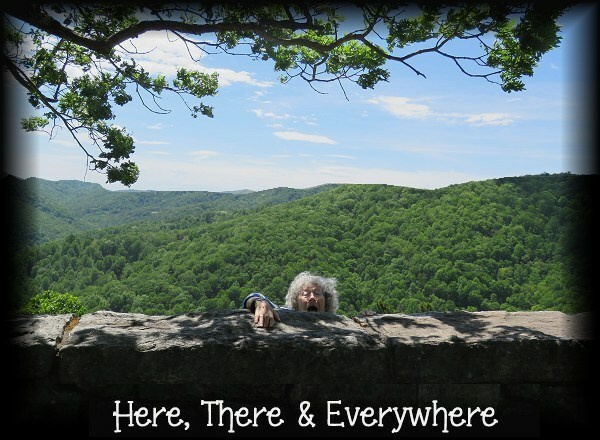 Then I am to list 5 blogs that make me think.. hmmm, "me and think" in the same sentence? Heh.. now there's something you won't read often lol! Dragon:050376 :Kiyotoe has already been nominated in the "thinking" category but I have to give him another shout about it. He, most of all, will make you think, when you read his posts. The Path The Path is a teacher, and brings up many subjects to make you sit back and agree or disagree and then write about it. House of Sternberg... Stewart is a teacher/writer (taking a break from his blog at the moment) Stewart, will make you think and challenge you to write stories. I guess the teacher is never far away as he tries to draw the most out of you. Stainless Steel Droppings.. Carl is a sci-fi/ fantasy fiction avid reader. He is continually trying to make you read ..and does a good job at it. Patricks Place... what can I say about Patrick? He's been around for quite a while. In between fun stuff Patrick hits upon current news,has some strong opinions of his own to add to them , and listens to those who leave comments, no matter if they agree with him or not. The Cornelia Funke (young adults) book, Dragon Rider, came in the mail today!! I have something to read!!!! It is made like her Inkheart book. Short and almost square.. very odd. But I am so glad to have something to read while I await other books that won't get sent until the end of the month. Those 6 books will begin my "re-reading" of the Dragonlance Series. I'm probably odd in that the books I really like, I try to re-read every few years. Though I know the basic story, I tend to forget small stuff and so I totally enjoy them all over again. Which is why I am in the midst of trying to get my old books in hard back form. I only get Social Security (about 620 a month) so things remain tight. I don't mind finding them as "used books" as long as they are in really good condition. And of course, that's because I know I will still read them more then once. I still have quite a few books to replace that way. One group is the first 4 Harry Potter books. My first read of them were my brothers hard back books. By book 5, I was buying my own hard backs but that means my first four that I own are paperbacks. Finding them at a cheap price is almost impossible. They seem to be holding their price or if someone does sell their hard copies they don't knock the price down very much. Anyway... I feel better now that I can rest on my bed with a book to read ! Oh, and in the mail my X sister-in-law sent me an article about Harry Potter .. in it there was a quiz.. did i ever mention how horrible I am at Trivia?? heh..
Well.. for those who aren't horrible, and have seen the Potter movies or read the books here are the questions.. see how many you can answer! What's the name for someone born into a wizarding family who has no magical powers? Squib. What do Hermione's parents do for a livingDentist. There's more but that's enough lol.. you can find the answers by highlighting all of the questions. Not to worry, I sure didn't know all of these and there were more questions!!... and you laughed when I mentioned that I re-read my books eh?.. well that's one good reason why!